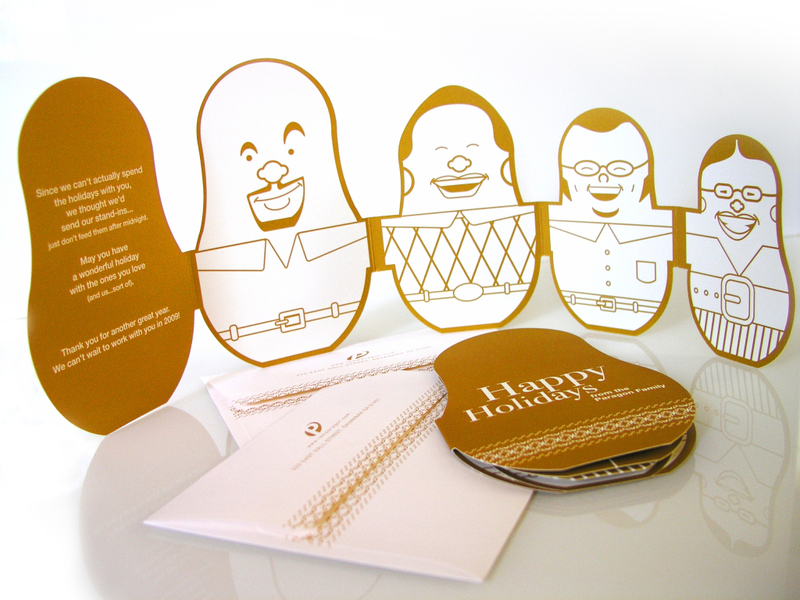 Our cards this year were all about our spending time with the folks who mean a lot to us. …I didn’t make any resolutions. All silliness aside, it’s a been a great year for us at Paragon. Our favorite part of what we do is the relationships we’re able to build all year round. I’m sure many design companies can attest to the fact that the people really make it fun, and over the course of our projects, our clients really do become a part of our extended family. In the spirit of that sentiment, our holiday cards this year were all about our spending time with the folks who mean a lot to us. We threw around a few different concepts, but finally settled the metaphor of a Matryoshka doll (Russian wooden nesting doll), which among other things is often used to portray a family. We’re pretty happy that the final product seemed to find the right balance between heart-felt sentiment and silliness. And on a final note – with so many people facing stressful and uncertain times at the moment, I hope we’re all going to take some time this holiday season to appreciate what we have, and look for ways help those who are not as fortunate. From all of us at Paragon, we wish everyone a happy holiday season!